These turkey breakfast patties are incredibly easy and I almost feel silly posting it because of their simplicity. These are great to keep on hand in the freezer, though they never seem to last that long in my freezer. 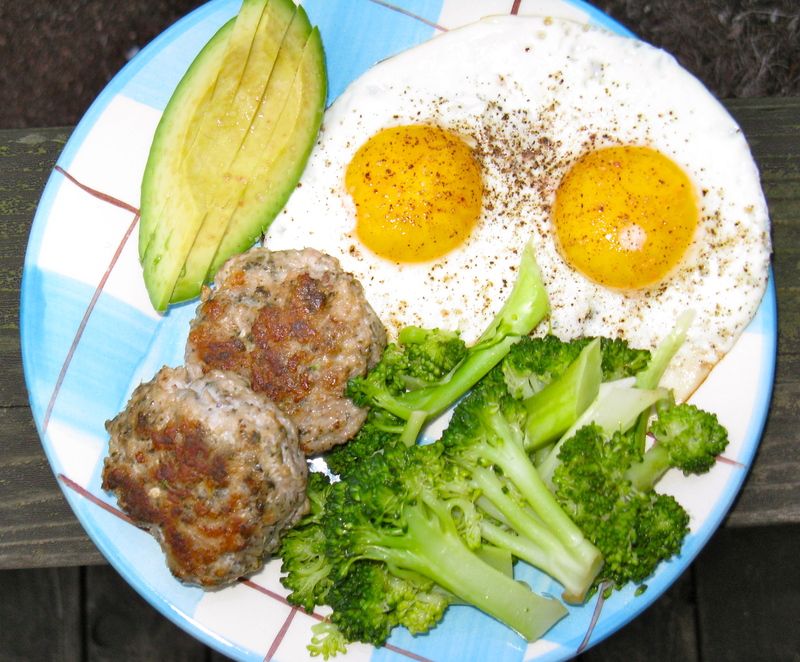 They’re great cooked up as bulk sausage in a scramble or as patties with sunny side up eggs, avocado and veggies, as seen in my photos. By the way, after today, I will officially be done with my first week of winter term…hooray! I had a lot of fun in my fitness assessment class yesterday, learning how to take blood pressures. This is a completely new skill for me and I found it very fascinating. It’s crazy hearing the swishing of blood through the artery. I have never heard that before! I’ve had my blood pressure taken countless times in my life, but never had the opportunity to listen to what a blood pressure sounds like. I’m pretty stoked to know how to do this and it wasn’t as difficult as I thought it was going to be. I was intimidated at first, but was fortunate to work with a great partner who had previous experience. He helped me a lot! Needless to say, I look forward to practicing more. Combine ground turkey and seasonings together in a large bowl. Mix well with your hands. Form into eight slider-sized patties. Layer between parchment paper and freeze. Alternatively, the patties can be cooked right away. 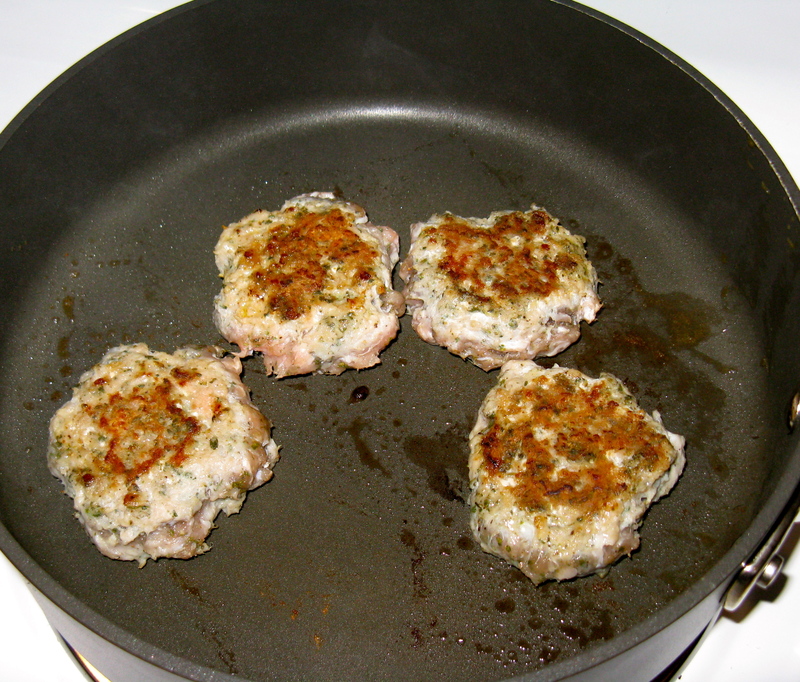 You can also cook as bulk sausage, rather than form into patties. If cooking as patties, these take about 3-4 minutes each side — a little longer if they’re frozen. I recommend melting a little fat of choice over medium-high heat in a skillet first. Then, add the patties and cook. Now this is my kind of breakfast… When I see some one eating cereal and fruit now I just don’t understand how it is filling! Great recipe! Thanks, Megan! I know, I don’t know how I ate cereal for so many years. I do always remember being hungry a short time later when I did. Even before I ate paleo, I was gluten-free and still ate GF cereal. Not a good breakfast! I eat TOO many eggs each and every day. I seriously think I need a 3 month elimination diet (from a lot of things), but i am kinda irrationally addicted to eggs. Oh boy. On that note, how do you get your eggs so PERFECT? Like step by step instruction and stovetop setting (from 1 to 8). I’d love to try homemade turkey burgers, but I am unnerved by the ground turkey i see here. I can force myself to eat the grain-fed turkey , but I still don’t have the nerve to go to the ground up stuff. Then cut out eggs if you’re concerned, Jill! No need to be irritated, just take some action, girl! To make my eggs, I just heat a small skillet and melt a little grass-fed butter or coconut oil. Then, I crack the eggs in and season with sea salt and pepper. I let cook over medium-low heat until the white is cooked through — maybe 5 minutes (not exactly certain on the time…not long though). You can also cover the skillet with a lid to make the process go a bit quicker. It’s best if you have a lid that’s clear glass though, so you can check on the eggs easier. I want to cut out eggs, but not sure what I’ll eat for protein in morning and lunch…I always eat eggs then. I can’t afford to buy tons of chicken/fsh and not the kind of person who wants to eat chicken/fish 2-3 times per day. Not sure…. Dinner leftovers from the night before makes an easy breakfast. Remember, breakfast doesn’t always have to be traditional breakfast foods. You could even try eating eggs every other day or every couple days and see if it helps. You could definitely use ground chicken too. I think the spice blend tastes nice with poultry. 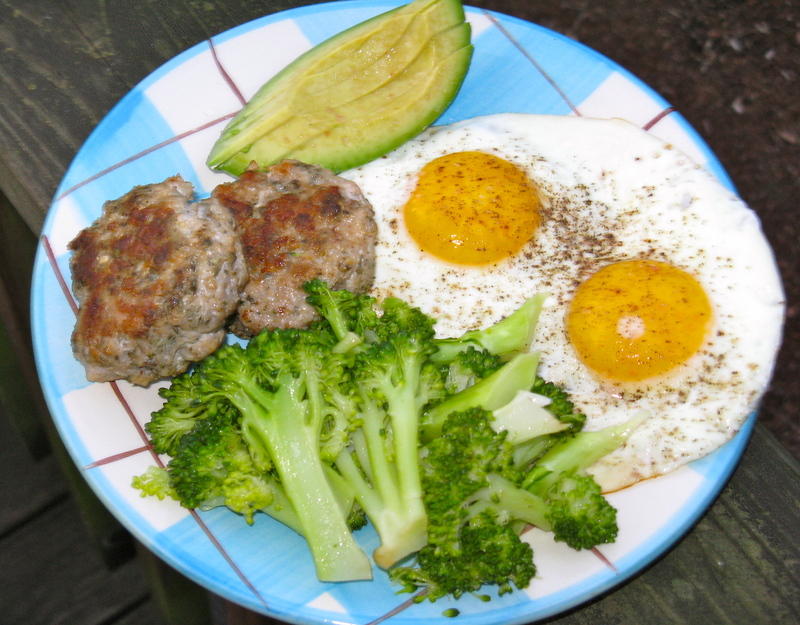 I haven’t made any beef breakfast patties, although have enjoyed some from US Wellness Meats. What do you spice yours with? I haven’t made them for breakfast before either but have made them for lunch or dinner. I love Ras el Hanout have you ever had it? The flavours are amazing. I find Tarragon or even rosemary work well with beef as well. Sometimes (If I have it made) I’ll use a Persian spice blend which is made of: 1 teaspoon ground cinnamon, 1 teaspoon ground nutmeg, 1 teaspoon ground rose petals, 1 teaspoon ground cardamom and 1/2 teaspoon ground cumin. I’ll use maybe a teaspoon or so of the Persian spice mixture in the patties… just depends! You have such an enviable breakfast plate, I think I’m going to go ahead and copy you on the whole thing! Hehe, thanks Hannah 😉 I agree, I like simple too. Thanks for the recommendations. No, I haven’t had Ras el Hanout, but have heard other people talk about it. I’ll have to get some. That Persian spice blend sounds awesome too. I love the idea of the rose petals. Where do you get your rose petals for it? I’m not sure I’ve seen them in Whole Foods before or not. I guess I’ve never looked for them though. Ras el Hanout is great I use it in a lot of things! I just buy that from Whole Foods. As for the rose petals well you can either get them from a Middle Eastern Grocery Store or you can get them online from Amazon. I haven’t seen them at Whole Foods around here. Maybe if you have a specialty spice shop around they could have it there, there’s shop near us that sells specialty teas and spices and they have it but Amazon is cheaper. Thanks! I’ll check at Whole Foods. We do have some specialty spice shops, so I can check there if need be. These were great! I added 1 tbsp of maple syrup and 1/4 tsp onion and garlic powder. It made about 12 little patties. Soo good I ate 3 with my dinner! Thanks, I’m glad you liked them and modified them to suit your tastes!